Here’s a new FREE app for the Kindle! 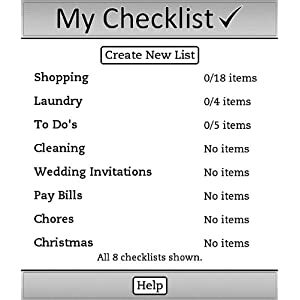 ‘My Checklist (A Free App for Kindle)‘ by Amazon Digital Services is available on the Amazon Kindle site for FREE. Just click here to download! Do you ever arrive at the store only to find you’ve forgotten your shopping list? Now you can keep your list on the one thing you’d never forget – your Kindle! My Checklist allows you to organize your life with up to 25 lists for your to do’s, shopping, invitations, party planning, reading lists, whatever! You can easily enter custom lists on any Kindle, and make fresh copies of frequently used lists, like Groceries, every time you need them. You will get a great sense of accomplishment as you mark each item on the list complete. You can even see your progress on your most recent lists at a glance! Never forget another thing with My Checklist! Indie Saturday – Author J. S. Dunn on “Bending the Boyne: A Novel of Ancient Ireland” New Kindle apps! Games and Reference, Language Tools!